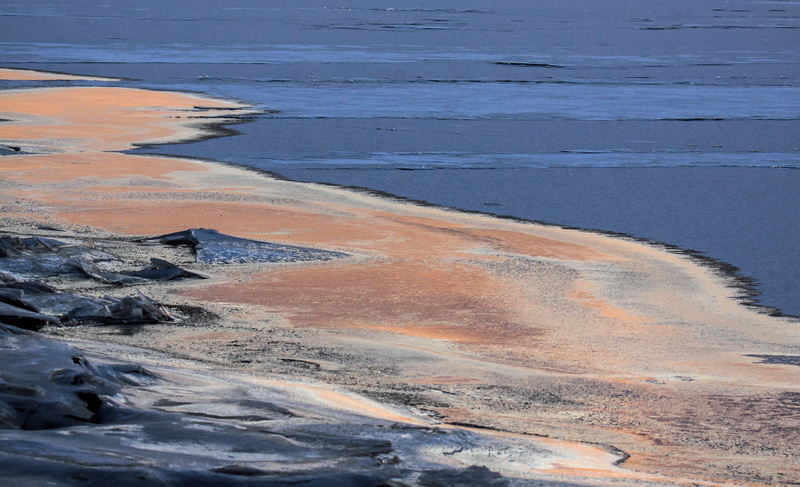 The sun had risen before I reached the water at Occoquan Bay National Wildlife Refuge this past Saturday morning, but there still was some color in the sky that was reflected by the ice along the shoreline, imparting blue and orange tinges to the ice. In the second shot, I used the wide-angle capabilities of my Canon SX50 superzoom camera to give you an overall feel for the moment. As you can see, the sun was not yet very high in the sky and the clouds helped to direct the sun’s rays directly down onto the distant water, giving it a kind of shimmer. I am now accustomed to carrying both my DSLR and the SX50 to give me greater flexibility in capturing different situations. 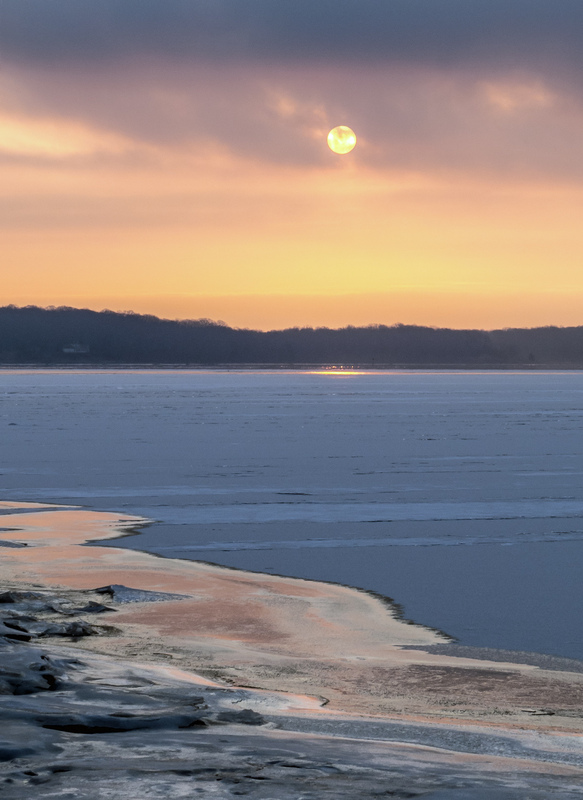 The sun was rising as I pulled into Occoquan Bay National Wildlife Refuge early yesterday morning. 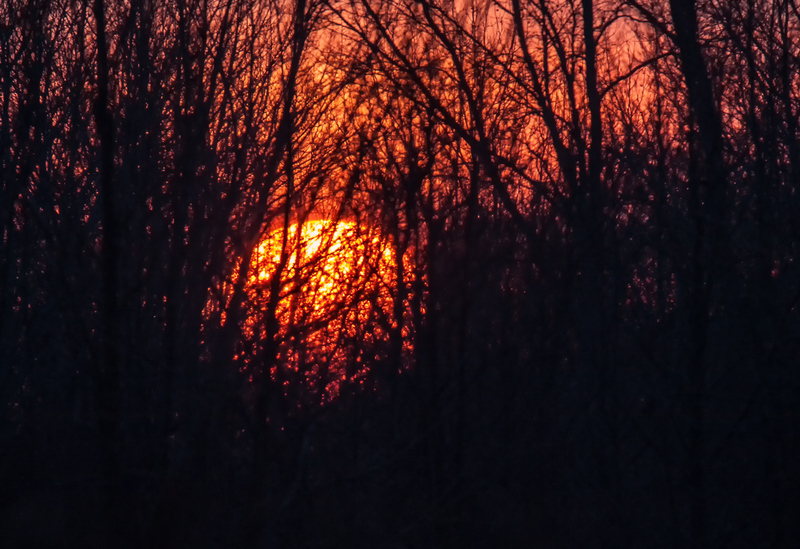 My view to the east was obstructed, but I did manage to capture this image of the fiery sun through the trees. It was a fun challenge trying to choose settings for the camera that let me capture both the sun and the shapes of some of the individual trees. In some of my images, the trees became one dark indistinct mass, so I kept making adjustments as quickly as I could, because the sun seemed to be moving amazingly fast.